“The Windsor Bridge has a high level of historic, technical, aesthetic and social significance as an important historical and physical landmark in one of the State's pre- eminent historic towns, and in the wider Sydney region.”. NSW RMS Heritage and Conservation register. Under Option One, this “... important historical and physical landmark in one of the State's pre-eminent historic towns” will be demolished. By these words alone the project is condemned. Windsor Bridge is unique. It is historically significant. It is technically significant. Its contribution to the visual narrative of “one of the State's pre-eminent historic towns” is recognised and well documented. It is a bridge of outstanding significance. Indeed, it is robustly contended the current Windsor Bridge, in addition to its status as an item of State heritage significance, is an item of National historic and engineering significance. 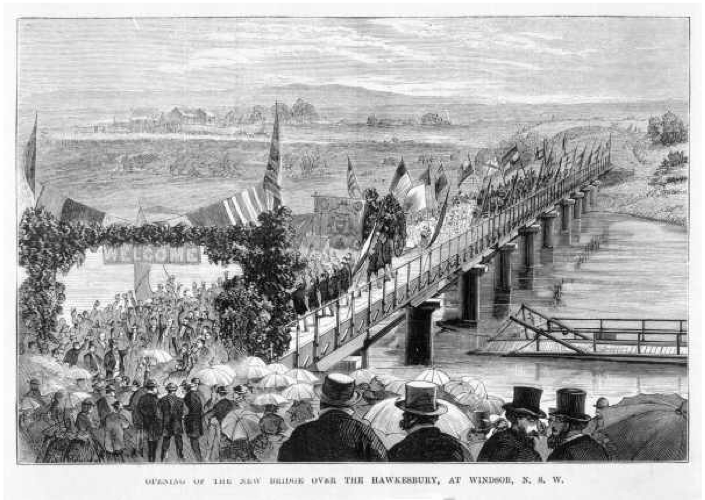 In 1874, as the outcome of extensive local political agitation and significant community action, the opening of the Windsor Bridge was greeted by the wider Hawkesbury community with a jubilant series of celebrations. In the report published in the Town and Country Journal, August 22, 1874* the excitement is clear, “The concourse of people was far larger than ever before gathered together in the town, and was variously estimated at 6000 to 7000”. The article goes on to say that a train from Sydney delivered the numerous visitors, and a procession of dignitaries, clubs, organisations and school children formed up at the Town Hall with bands and banners to march to the Bridge, across it and back. After the Bridge was declared open the school children were “regaled with cakes, buns, and sweets. In various parts of in the grounds were also erected Punch and Judy shows, and other diversions for the amusement of the children.” Celebrations included roasting a bullock in the Square, a formal luncheon held in the School of Arts and a public ball, held in the evening in the old barrack room. Today the significance of Windsor Bridge is recognised with its inclusion on the RTA Heritage Register (Section 170). 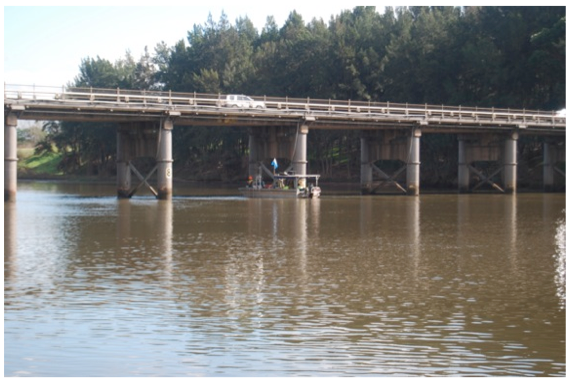 It is the oldest surviving crossing over the Hawkesbury section of the Hawkesbury-Nepean River and is only the second method of crossing, (the first being the punt that had serviced the town since 1794), the opening in 1874 celebrated the completion of a major piece of public infrastructure which was to contribute to the development of the historic Windsor township. 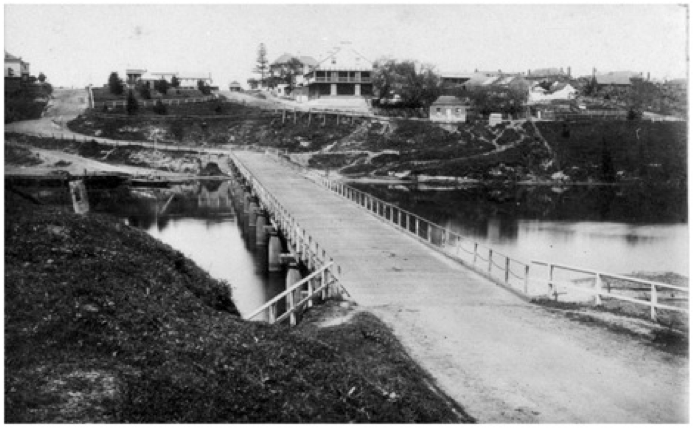 The design of the bridge came from the NSW Department of Public Works and construction was the work of William King Dixon and Andrew Turnbull, both notable engineers in the colony. Dixon came to the colony to work on the first railway in NSW and Andrew Turnbull was an experienced bridge builder who became business partners with Dixon before his (Dixon's) death. Andrew Turnbull went on to build many other bridges in the state including over Cattai Creek and Wisemans Ferry Road. James Mills Photograph 1888. ML At Work and Play Image 04405. 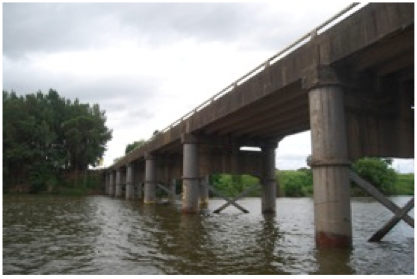 Recent research (Wedgewood and Brassil) has revealed it is the earliest use of precast concrete girders in NSW bridge construction, some 30 years before the technology of pre-stressing was sufficiently advanced to allow the general use of precast structural beams. Engineering Australia, in their EIS response, attribute the bridge with substantial heritage value, making specific reference to the cast iron piers. The 1874 bridge has piers made of cast iron cylinders more usually associated with railway bridges but here designed to resist the severe flooding experienced by the Hawkesbury. The simpler timber structure and deck of the upper construction was more usually employed in the construction of road bridges. Whilst neither construction method is, in itself, unusual, the amalgamation of these two separate technologies in a bridge constructed in the 1870s, is however, extremely rare. 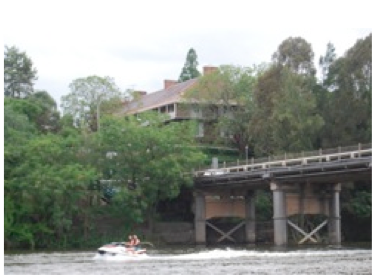 Furthermore, the 1922 precast reinforced concrete girders with a concrete deck above, replaced the timber superstructure, which is unique for its time, the first documented use (in NSW and possibly in Australia) of this technology for bridge construction by some 30 years. This replacement of the timber components with precast reinforced concrete girders and reinforced concrete deck introduces the twentieth century technology previously mentioned. No other bridge compares to it elsewhere in NSW. This is not true. Most recent research, undertaken by Ray Wedgwood, retired bridge engineer, in conjunction with Tony Brassil, industrial archaeologist, confirms the concrete girders were precast and then lifted into position. This was arguably the first time this technology was used on a bridge in NSW and most likely Australia. The Wedgwood-Brassil findings are confirmed in Windsor and Richmond Gazette 20 January 1922, (Windsor Bridge – Reconstructed with Reinforced Concrete, pages 1, 2 & 5) which reports the precast concrete girder system as structurally 'unique'. This early use of precast concrete for Windsor Bridge has strong associations with Mr Percy Allan, chief engineer of the NSW Public Works Department who over his distinguished career was responsible for the design of 583 bridges; this is the same ‘Allan’ after whom the Allan Timber Truss was named. It also relates to Mr G.W. Mitchell, manager of the State Monier Pipe and Reinforced Concrete Works who would have arranged for the precasting of the reinforced concrete girders and to Mr G Humphreys foreman of the 1922 bridge structure and deck replacement. Using this advanced technology enabled part of the bridge to remain trafficable whilst the other part was being replaced. Indeed, the ongoing development of the bridge testifies to its significance over time as engineers upgraded and maintained the Bridge to ensure its viable and continued use. The raising of the original timber deck bridge in 1897 by approx 2.4 metres is typical of this approach. As such, Windsor Bridge has the potential to increase current knowledge regarding nineteenth century building practice and very particular aspects of it, for example, the methods used to sink the cast iron cylinders into the riverbed. The Bridge also has the potential to increase knowledge and understanding of twentieth century technology used in pre-casting the reinforced girders that span the cast iron piers. The Bridge is a visually modest structure: its scale and proportions consistent with its location and historic context. There is an honesty and lack of pretention in its design. It is functional and reflects the technologies of its construction without unnecessary decoration. 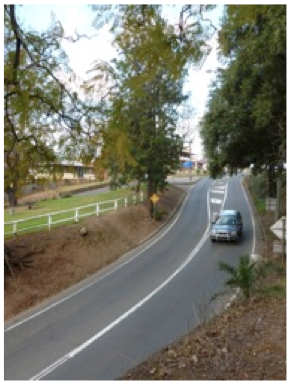 The approach road, which has evolved over time is equally harmonious with the immediate heritage landscape comprising Colonial, Georgian and Victorian structures. Whilst newspaper sources reflect the controversy that accompanied the cost and the location of the bridge, the descending approach from the south has an intimate feel, due to the framing provided by the cutting itself and the modest scale of the approach road, consistent with the broader agricultural landscape and the immediate heritage precinct. The bridge reinforces and encourages the traveller to witness the relationship of Thompson Square with the river itself. Whilst no real effort has been made by local, or State authorities, to provide interpretive information, the Bridge makes a significant contribution to the waterfront aesthetic and defines the northern boundary of the Square. In descending from the George Street level to the bridge deck the traveller may gain an appreciation of the role of this public space fronting the River and the changing use of the Square from an early destination port for produce and services to a vibrant community space. Indeed, the River, this crossing and the associated public Square have defined the life of generations of local inhabitants on both sides of the River. The community's relationship with the River is at times ambivalent, their lives having been interrupted by its flooding. However, as the anodyne outskirts of suburban Sydney approach the still-distinct and distinctive Macquarie Towns, the rich history of the area and its physical remains become increasingly important to the community's sense of identity. Windsor Bridge has been an inseparable part of the township and community for almost 140 years. It remains a landmark feature of the Windsor township and particularly Thompson Square. Today, Windsor Bridge physically demonstrates, in an built form and language respectful of its venerable context, the historic connection between the northern and southern banks of the Hawkesbury River and by inference, the relationship between the surrounding agricultural areas and Thompson Square itself, which is undisputedly Australia’s earliest and remaining civic square. Indeed, the bridge is a visual element that reinforces the role Windsor, by any name, has played in the region since 1794. However the significance of Windsor Bridge is not limited to its immediate vicinity. Like the Hinton Bridge over the Paterson River, Windsor Bridge is historically significant in the development of the NSW road network, and more specifically in the development of the road network in the Hawkesbury Region, forming a critical link between routes that have existed since the very early nineteenth century. For almost 140 years the bridge has functioned as an all-important connection between communities on either side of the Hawkesbury River and as an essential component in a route important in the development of the Sydney region. A series of major upgrades to the bridge since its construction further enhance its historical importance. These upgrades also acknowledge the importance of the bridge as a crossing of this major waterway with its frequent floods which have historically been such a significant, and to some extent defining, influence on the lives of the community on both sides of the River. Windsor Bridge has demonstrable heritage significance far beyond the current level of recognition. The proposed demolition of historic Windsor Bridge represents and unconscionable assault of Australian engineering history. The demolition of the bridge is also an irreversible and hostile assault on a heritage landscape icon, one that arguably contributes to the economic wellbeing of Windsor business. There is more-than sufficient heritage justification for the current bridge to be restored and to remain in situ. Restored, Windsor Bridge provides a charming and ideal access point for light and local traffic access to Windsor. Restoration of Windsor Bridge would make a genuine and positive contribution to local economic conditions.